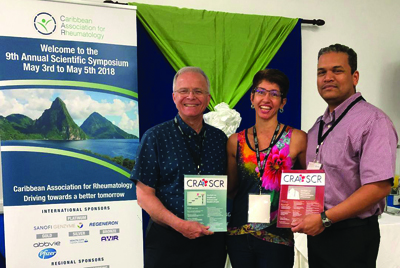 The ninth annual meeting of the Caribbean Association for Rheumatology (the other CRA, but warmer) was held in May 2018 on the beautiful island of St. Lucia. The conference served not only to provide continuous medical education for regional practitioners, but also as a forum for networking, and promoting rheumatological care and research within the Caribbean. On opening night, Dr. Thorne presented a well-received public lecture on models of care, followed by the plenary session demonstrating the efficacy of team-based care. Dr. Carmona reviewed the safety of biologic therapies and provided an update on osteoporosis, including risk stratification in a region where Bone Mineral Density (BMD) is not available on some islands. Two other Canadian speakers (Dr. Nicole Johnson and Dr. Aurore Fifi-Mah, both from Calgary) truly made this the other CRA. Unfortunately, the snow had all melted (leaving just gorgeous beaches and warm sand behind!). The attendees, including the Caribbean’s own Professor Eon Nigel Harris (yes, the doc who developed the anticardiolipin test and defined anti-phospholipid syndrome), were treated to a high-quality program. This included a pre-conference workshop on musculoskeletal ultrasound, delivered by a group of Scottish rheumatologists (who have become regulars at the CAR). The main part of the program included basic science topics, updates on several diseases, clinical research presentations by regional rheumatologists, as well as talks aimed at developing research and clinical databases within the Caribbean. The second part sought to educate primary care practitioners on a number of high-yield rheumatology topics. Of course, this would not be the CAR without a party (this is the Caribbean after all!). Dr. Amanda King, president of CAR, opened her home to a pool-side party for all attendees on the second night. The DJ (whose day job happens to be obstetrics and gynecology), filled the air with infectious soca music, and also taught the crowd to dance bachata. The conference was capped off with a visit to the majestic Pitons mountains and nearby beach on a party boat (what else?). Despite the party though, no one lost sight of the core mandate – improving rheumatological care in the Caribbean. In addition to the geographic challenges of providing care to patients dispersed across islands separated by great breadths of ocean, and the fact that there are no rheumatologists on many islands, there are several other challenges. Investigational modalities such as bone mineral density (BMD), computed tomography, and magnetic resonance imaging are not available on many islands. Some serologies have to be sent overseas. You only order it if you really need it – it’s Choosing Wisely incarnated. The cost of biologics renders such therapy simply inaccessible to the vast majority of patients. Even traditional DMARDs impose a cost barrier to many patients. What they lack in resources though, the local CAR rheumatologists (assisted by North American counterparts with Caribbean roots) make up in passion. With this group, the future of rheumatology in the Caribbean is as bright as its sunshine.